Tooth crowns have been used in dentistry for over 2000 years. There is evidence that the Etruscans experimented with crowns on teeth using ivory and bone as early as 700 B.C. By 200 A.D., they began using gold crowns to construct artificial teeth. Ancient Egyptians fashioned tooth replacements out of seashells and then hammered them into their gums (conscious sedation, anyone?). Porcelain crowns were first used in the 1800s. With the refining of metal casting methods in the 1900s, restorative dentistry advanced significantly. Today in Carmel, porcelain dental crowns are used to give you a beautiful, restored smile. The material used is determined by several factors. If you suspect you need a crown, want to replace an old crown, or want to learn about other cosmetic dentistry procedures, call Dr. Dale Behner at 317-842-2337. 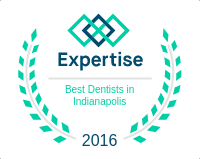 Dental Care Today is located at 9744 Lantern Rd, Fishers, IN 46037. We have been serving clients in the Carmel area since 1984. We can recommend the best tooth restoration or cosmetic dentistry option for you.